Event Blogging!! I am sure you must have tried this kind of blogging or at least heard this name. Event Blogging is consider as quick and huge money making method of blogging where you can earn four figure dollar incomes in just 1-2 days. Event blogging is in trend these days and must of the blogger try this. Some fail where as others earn great from it. Don’t worry if you fail because your experience will work for you in the next event. Today I will be sharing Top 25+ Events for Event Based Blogging. There are more than 50 events every year on which you can work and earn huge money. So, it’s really and quick way to generate huge cash depending on the event you have targeted. Some events can give you much more money where competitions are more like Happy New Year where as there are lots of events where you can’t get that much money due to small number of audience but competition is less and easily you can rank. How to Start with Event Blogging? As per my view event blogging is all about hard work and understanding. If you will work hard and you know the concept of blogging, you will get success for sure. The main thing in event blogging is ranking. The higher you rank in search engine the more you earn. In this article, I am not going to tell you how to rank your event blog but to tell you what are the main events that you can target to earn more. Don’t worry we will share all the footsteps to build links for event blogs in the coming articles. If you want to know more about link building, you can check Experts' Link Building Tools and Garrett’s advanced link building techniques. So if you will do proper on page and off page optimization then you will get success for sure. Target any event well in advance (couple of months will be fine) and write few quality contents so that you can easily get authority in search engines initially. Start building links from the first day itself and build some high quality links also. This will help you to get higher SERP. The main part in event blogging or any blogging is the selection of keyword. The better keyword you will target, the more will be the chance of ranking. I would suggest you to start with FREE Google Keyword Planner tool and search for low competition and high searchable keywords. Spend some good time while keyword researching as this will ensure your success. Suppose you are targeting Happy New Year event then you can target Happy New Year 2016, New Year 2016, Happy New Year 2016 Images, and Happy New Year 2016 Quotes etc. These are highly searchable keywords. Also what I have seen that New Year 2016 keyword is easy to rank compared to Happy New Year 2016 and traffic is almost same. So be cautious while selecting keywords. So if you are still not sure which event to target, here is the solution for you. Here I am going to list Top events for event based blogging. Pick any one and start working as much as you can. Don’t worry all the events have more than 1500k+ traffic a day through event blogging. This is an infographic and you are free to use this infographic but make sure you are giving proper credit to us. 1. Happy New Year: This is the craziest event that any blogger target. Though this is a one day event but the searches are more than 1500k+ in just a single day. If you are getting the top position for just few keywords, be sure you will get huge money through it. As searches are more and income potential is also big so the competition is slightly higher than the other events. 2. Cricket World Cup: Even though cricket world cup comes once in four year but this is also one of the event blog which can guarantee you the success if worked well. World cup usually continue for 15-20 days and have a huge potential for money. Though this is not a global event like Happy New Year but still gets 1000k+ search each day. 3. Exam Results: This is a worldwide event and you can target even a country also if not worldwide. Here I mean to say that in every country there is a season when results are getting declared (we have April-June in India). 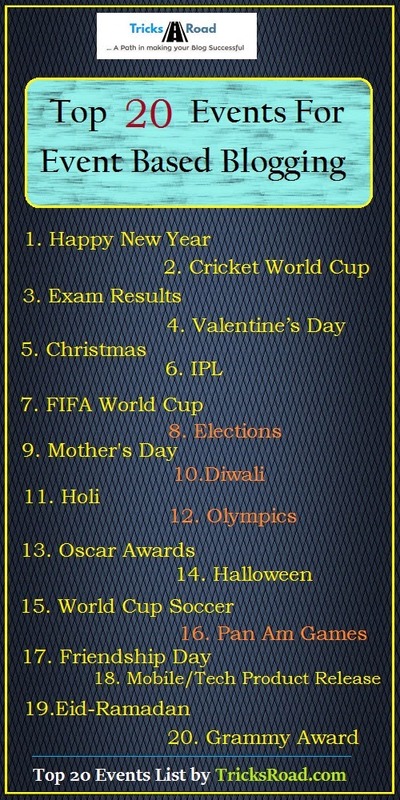 Target any such season and get success. 4. Valentine’s Day: A single day event but global and so searches are more. Even though Valentine’s Day just happen on 14th Feb but you can target that whole week where Rose day, Teddy day etc. come and you will get huge traffic whole week. 5. Christmas: Generally bloggers who are targeting Happy New Year also target Christmas but as bloggers have started targeting each and every small event so getting ranked with other EMD is bit tough. So targeting Christmas can be a huge success as competition is less compared to other event blogs. 6. IPL: IPL is Indian Premier League but is getting followed in many other countries as well like South Africa, Australia, West Indies etc. and from all the countries where cricket lovers exist. IPL runs for more than 1.5 months and if properly targeted you can get huge traffic and money. 7. FIFA World Cup: Football is the craziest sports played worldwide. This event runs for around a month and so have a great chance of winning in blogging. This has even more traffic from Cricket World Cup as the audiences are more. 8. Elections: If you have interest in politics then you can target elections as well. You need to do little bit more work and have to select proper keyword as .gov sites will have more preference rather than event blogs. Elections can also be targeted country wise. 9. Mother’s Day: A single day event but has good amount of traffic. It’s a worldwide event so you can expect good return. 10. Diwali: Diwali is a special festival enjoyed in India. It is also a one day event and can be targeted easily as competition is less. It’s a good event to start with for a blogger who is going to try first time. 11. Holi: Again an Indian event which celebrated on a single day but in some places two days. This event is also easy to target and a newbie can start with. 12. Olympics: An international event having great source of income. Though it comes once in four years but you can easily target few games and as it runs for 15-20 days so you can earn good mount. 13. Oscar Awards: Oscar is the most prestigious award in the entertainment. Oscar is considered as the highest award in film industry. This event is one of the most searchable keywords targeted worldwide and is worth trying. If you are doing for the first time, you can target Oscar as competition is less. 14. Halloween: Halloween is very famous in US and has high CPC. This event has high potential of earning. 15. World Cup Soccer: Similar to other world cups, Soccer world cup also comes once in four year but again this is a big event. 32 nations and billions of people from different countries involve in this great event through different means. 16. Pan Am Games: Thousands of athletes descend on southern Ontario every summer for the Pan American and Parapan American Games. This events is mainly famous in US countries. The Pan Am Games take place July 7 to 26, with the Parapan Games following on Aug. 7-15. It is also worth trying. 17. Friendship Day: We all know about this event and are very famous in young people. This is also a worldwide event and if worked fine, you can easily earn four 1000-1500 dollars. 18. Mobile/Tech Product Release: Yes, this is also a worth targeting. Products release like iPhone, windows etc gets huge traffic and you can easily get $500-$1000. 19. Eid-Ramadan: These are the biggest event in Muslims and celebrated worldwide. Also these are easy to target due to less competition. 20. Grammy Award: Again a worldwide event with less competition. For a newbie it is a good event to target initially. This is the biggest music event and even you can earn many dollars from YouTube videos. 21. WrestleMania: WrestleMania is the biggest WWE event and the competition is very less. So you can easily try this event. 22. Big Movie/TV Shows Release: This may sounds light but yes I have seen people targeting big release of the year like Fast and Furious movie and has earned $500-1000 very easily as the competition is very less. You can also target such low competition events. Similarly you can target TV serials as well like Kahtro ke Khilari etc. 23. Chinese New Year: This is the biggest holiday of China and is celebrated between January 21 & February 20. You can target this country specific event easily. 24. Sundance Film Festival: Sundance film festival is one of the most famous film festivals in USA which occurred almost at the end of January every year; this is also one of the easiest events to target as competition is very less. 25. La Tomatina: I am sure you must have seen this in movies. La Tomatina is the most famous event in Spain. Here a group of people throw tomatoes at each other. 26. The Battle of the Oranges: This is one of the craziest events of Italy. Here a group of people throws oranges at each other. 27. The Carnival of Rio de Janeiro, Brazil: Happens in February or March. It is a week of extravagant parades, dancing, colors, and alcohol makes this one of the most exciting and well-known festivals in the world. 28. Calle Ocho, Florida, USA: This occurs in March every year and exciting Cuban street festival in Little Havana, with food and live music. 29. Festival of the Sun, Peru: This is enjoyed on 24th June and is very famous across the world. 30. Rakshabandhan: One of the religious festivals in India. You can easily target these small events. These were the 25+5 top events list for event based blogging. You can target these events to earn big amount easily. If you are a newbie I would suggest targeting small event having less competition first to gain some experience and then move to big events. 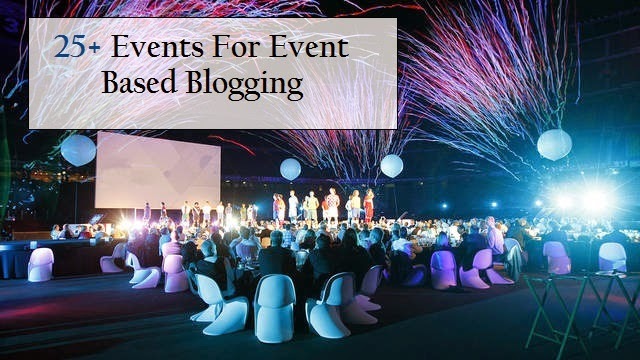 I hope these top events list for event based blogging will help you to plan for your events in good manner. So start with money blogging and let’s share your experience in comment. Also if I missed any, do let me know in comment. Also, please share the article so that others will have benefits as well. Which event you are targeting?